This year, instead of a big Easter dinner, my family and I had Easter brunch with James and a few of our neighbours. This carrot cake is the result of my desire to contribute to our meal, a sudden realization that I have less than a month until my raw commitment commences, and an abundance of dehydrated almond pulp left over from making almond milk. I must admit, it was a pain to make the almond pulp into a workable flour. The pulp had dehydrated into clumps, so I had to break it down in a food processor, then sift it to ensure a fine texture. I expect regular almond flour would work in its place, but I'm not sure—the almond pulp seemed to really soak up liquid, making the batter similar to a quick bread, rather than a traditional cake. In any case, it's a delicious use for leftover nut pulp. The texture of the cake is very dense and moist. 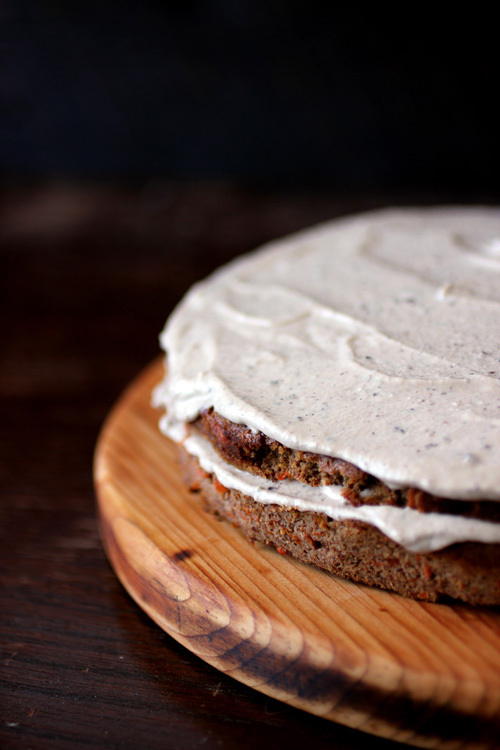 The flavour is sweet and wonderful, and the cashew cream cheese icing is a pleasant, nutty and slightly sour compliment to the cake. I was thrilled that the cake and icing tasted so nice, and that I got to share it with my family and friends. I was also really excited because I got to serve it on my new serving board, that James made! He found an old table my parents were throwing away, re-claimed it, sanded it down and gave it to me this weekend—I love it. *approximately 5 large eggs, separated. 1. Sift together first 8 ingredients. Add grated carrot and mix until coated. Set aside. 2. Combine next 4 ingredient. Set aside. 3. Beat egg yolks at high speed until foamy; add honey/oil mixture in a slow, steady stream and continue to beat until light and thick. Add yolk foam to dry ingredients and mix by hand until completely incorporated. 4. Beat egg whites at high speed to wet peaks. Add 1/4 of the whites to the batter and mix thoroughly. Gently fold in remaining egg whites—some egg white streaks should still be visible. 5. Spread evenly in a greased and lined 9-inch cake pan. Bake at 325 for about 50 minutes. 1. Prepare Cashew Yogurt, as instructed here—add the vanilla bean during the blending of the cashews and water. 2. Pour the fermented cashew yogurt into a jelly bag, nut milk bag or a couple layers of cheesecloth and hang to dry for about 8 hours—this is to both ferment and thicken the yogurt. 3. Stir in maple syrup and refrigerate until thoroughly chilled before using. Beautiful recipe! 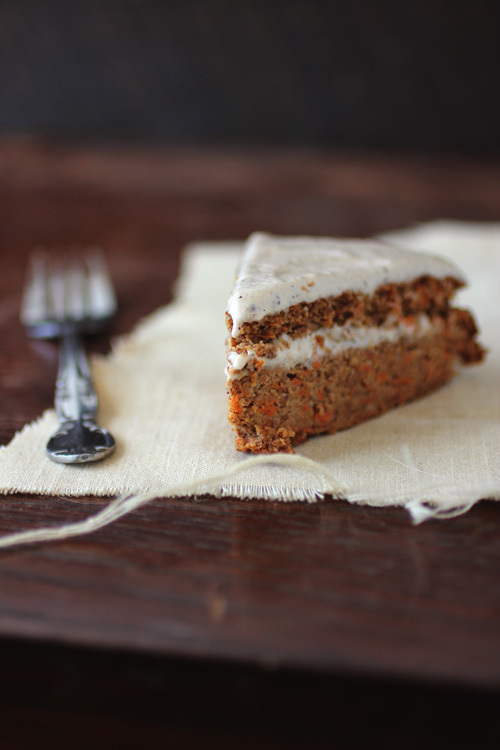 I've been seeing a great many carrot cake recipes this Easter, but yours really takes the cake (pardon the pun). Can you recommend an alternative to the almond pump? Would blended almonds do the trick? Thanks! Looking forward to making it. I mention in the post that I think regular almond flour would work, though you would perhaps have to adjust the amount of liquid in the recipe. If you can grind your almond fine enough, they might do as well. But, as I haven't actually tried it myself, I cannot say for sure. 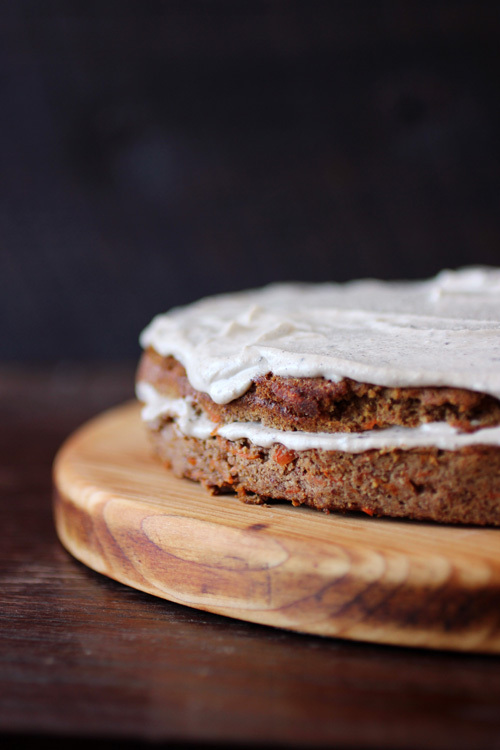 omg.. healthy carrot cake? !yes please. My only setback with this recipe is that I am allergic to cashews! Is there a way you think the icing could work using something else like soy milk? I want to make this so bad! What a shame to be allergic to cashews! What about sunflower seeds? You can make the nut yogurt with those (though you need to adjust the amount of water—needs to be the consistency of a heavy cream) and then follow the icing instructions from there. I am not sure about soy—you could probably make yogurt out of soy beans? Whatever you use, the result has to be an icing with a thick enough consistency to spread. This looks amazing! 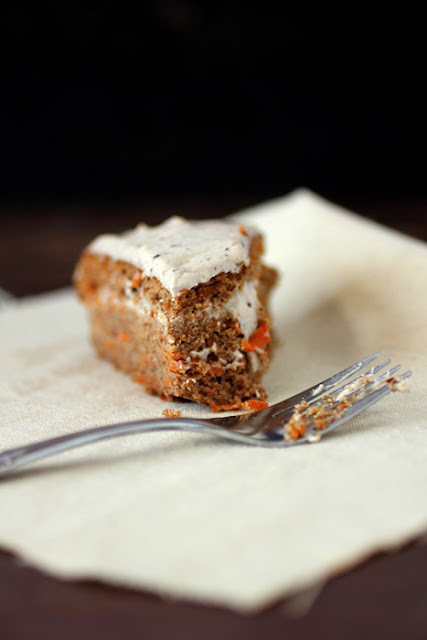 Carrot cake is probably my favorite thing. And your new serving board is lovely! I'd like to try out this recipe, and I'm extra curious as to what the icing tastes like. Awesome photos and recipe!! I can't wait to try it! !